Life Fitness is a global leader in the design and manufacture of a full line of high-quality fitness equipment for commercial and consumer use. It is the largest commercial fitness provider in the world and the only fitness equipment manufacturer that has been providing premium equipment for more than 35 years. Life Fitness' cardiovascular and strength training products are used in health, fitness, and wellness facilities, as well as in homes, worldwide. The Life Fitness Owatonna facility applies powder on two finishing lines. Both finishing lines have in-line shot blast. 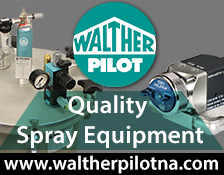 Pretreatment is done with two 6 stage spray washers utilizing zirconium based non-phosphate technology. The newest paint line has in-line two coat capability. The tour will focus on both paint lines including the new line completed in 2017 as part of a large facility expansion. In addition, the tour will include flat and tube laser-cutting, roll forming, CNC bending, manual and robotic welding, and assembly. No open toe shoes and safety glasses are required. Parking: Front of the main building.